The Mayor is so excited about early-season per-possession stats he borrowed an outfit from the Sonic red velvet cake ad. Hoiberg even kind of looks like the Sonic guy. ACC: Reveal thyself, North Carolina! On paper the Tar Heels are egregiously underrated, but I can at least see where the pollsters are coming from. The beautiful efficiency margin you see here was achieved entirely at the expense of Clemson (albeit at Clemson) and Virginia Tech (in Chapel Hill). Throw in three coin-flip games (one-point loss at home to Notre Dame, one-point win at home against Louisville, two-point win at NC State) and you have UNC’s conference season to date. Nor is this “How good is North Carolina, really?” confusion likely to be dispelled anytime soon. The Heels play at Wake Forest tomorrow night and then return home to host Florida State and Syracuse. Three wins there aren’t going to send UNC shooting up to the top of the polls. That’s fine, I can wait because my question with Roy Williams’ bunch concerns where they belong among the conference’s elite. One thumbnail of the ACC’s top tier would go like this: Duke is a talented enigma currently wrapped inside of a looming big round number pertaining to its coach. Notre Dame might be better than anyone in the country on offense, but won’t be setting any records for D. That makes Louisville bizarro ND and Miami lil’ ND. NC State is a talented enigma that plays really well at home. But if you ask me which ACC teams have at least the potential to be elite on both sides of the ball, my answer would be Virginia and, possibly, North Carolina. We’ll see how that theory fares, but, again, we’ll have to wait a while for a verdict to be rendered either way on the Heels. It’s possible that the best unit in the Big 12 on either side of the ball is the Texas defense, and if this does in fact turn out to be the case an offense that’s merely normal could yield big returns for Rick Barnes. Moreover Kansas visits Austin this Saturday, and with the sassy new-look post-Withey Jayhawks now reliably allowing opponents to score 1.07 or 1.08 points per trip (a la both Iowa State and Oklahoma) UT has a chance to strut any stuff it might have on that side of the ball. For a one-and-done star who’s having an excellent season, Myles Turner sure is doing so with a minimum of fanfare. (It can’t be simply that he’s not starting, can it? I thought we got past that with Dion Waiters.) All I know is that a guy who draws six fouls per 40 minutes and shoots 88 percent at the line provides a huge boost on offense, even if he does come off the bench. If Turner had the same exact stats in those two departments as a plucky tough-as-nails point guard he’d be the toast of Twitter. Turner is also a shot-blocker who’s brought his foul rate down to 3.7 whistles per 40 minutes in Big 12 play, and he may turn out to have legit perimeter range. I see you, Myles. Last night Twitter was all abuzz about how great Kansas looked in the first half at home against Oklahoma. And Kansas really did look great in the first half at home against Oklahoma, which was why I switched over to see how Villanova was faring at Georgetown. You know the rest. The Sooners made things interesting in Lawrence, something the Wildcats never quite managed to get done in DC. And given that Nova is, we think, a stronger foe than Lon Kruger’s team, we should have been more impressed by what the Hoyas were doing all along, yes? Anyway, that’s how it felt in real time. Georgetown absolutely dominated a top-five opponent, and with no fewer than five Big East teams now showing a “2” in the loss column this (blessedly round-robin) league should now be able to provide some high-quality entertainment. Which brings us to the Hoyas’ next game: Saturday, at Marquette. Georgetown’s been scoring points in large part by getting to the line (D’Vauntes Smith-Rivera scored 17 points against Nova despite 3-of-10 shooting from the floor), and Steve Wojciechowski’s team sports the Big East’s lowest number for opponent FT rate. The game in Milwaukee should be fun and instructive, if that’s possible. Tom Crean’s men rejoined the top 25 this week after winning by three at home against Penn State and by six on the road at Illinois. At 4-1, IU has the same record in conference play as Wisconsin or Iowa, but, as seen here, the Hoosiers have also scored fewer points than their Big Ten opponents to this early point in the season. The pollsters may well turn out to be correct, and we may indeed be seeing Indiana at low-Tuesday-Truths-tide right here. This is a group that’s shot just 32 percent on its threes against conference opponents, and that feels awfully low for the likes of James Blackmon (who’s shooting 42 percent from out there for the season), Yogi Ferrell (38 percent), Robert Johnson (40), and the increasingly Jordan Hulls-like Nick Zeisloft (also 40). Stick the blossoming Troy Williams in the middle of all those shooters and you can make a case that the skilled and well-spaced Indiana offense is now more Michigan than Michigan. Then again IU’s league opponents haven’t exactly been flukey-good from beyond the arc either. Nebraska, Michigan State, Ohio State, the Nittany Lions, and the Illini have combined to hit just 30 percent of their treys against Crean’s guys. That, along with a laudable lack of fouling, constitutes the prime defensive strength of a unit that rates out as below- average in terms of protecting the rim, pulling down opponents’ misses, and (goodness knows) forcing turnovers. Speaking of a laudable lack of fouling, Maryland comes to Assembly Hall on Thursday night. Melo Trimble will drive the lane and fling himself like a missile into the chest of whatever white shirt presents itself. The zebras in their infinite wisdom will classify this as a violation by the home team — or will they? Can IU keep the Terps off the line? That question and the number of threes that fall for Mark Turgeon’s bunch could be decisive. Churchill said the best argument against democracy is a five-minute conversation with the average voter. 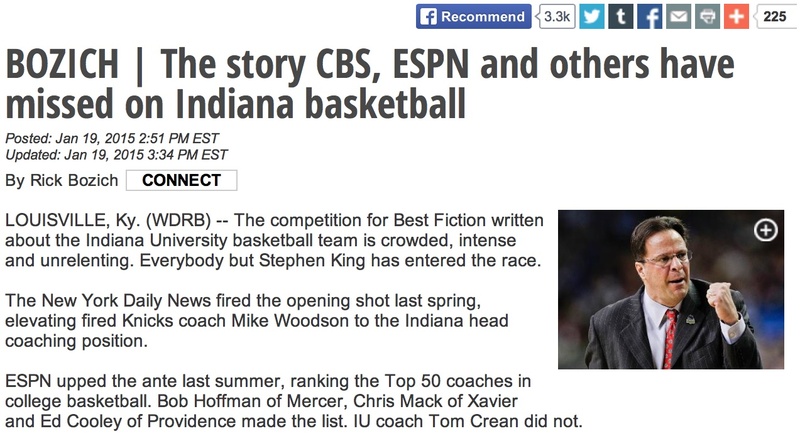 As for Crean being left off that top 50 list that my colleagues and I voted on over the summer…. All I can say is that’s vox populi for you, and in this case the electorate was almost as numerous (45) as the honorees. As a voter who was personally responsible for 2.2 percent of the turnout, I can attest that the election was conducted under the supervision of Jimmy Carter and was entirely free of any voter ID harassment. We even let Jeff “Virginia will lose its next game — who are they playing again?” Goodman vote! Arizona and Utah may well be the best or at least “most elite nationally” two-team rivalry the Pac-12 has had since, well, ever. (Bearing in mind the conference only acquired its current membership and name prior to the 2011-12 season — this isn’t Stonehenge we’re talking about.) As the figures shown here suggest, we may arrive at the end of the season and say the Wildcats and the Utes really did have the league’s two best offenses and its two strongest defenses as well. So, yes, give full credit to Sean Miller for throttling the visitors 69-51 in Tucson over the weekend. If early trends are to be believed, Arizona may be easily the best rebounding team in the entire sweeping history of the ancient and venerable Pac-12 conference. No, really, these guys use rebounds as a weapon — Stanley Johnson, Rondae Hollis-Jefferson, and Brandon Ashley I salute you. I’ve done my fair share of knuckle-rapping and tut-tutting on how offensive and defensive boards are completely separate animals. Indeed they are, and the Wildcats are masters of both animals. Their defensive rebound percentage in Pac-12 play currently stands at a somewhat robust 83.3. And on a day when UA and Utah both posted the exact same accuracy from the floor (in terms of eFG percentage), Miller’s guys beat the stuffing out of the visitors anyway by grabbing 53 percent of Wildcats misses. We’re looking far, far down a murky road here, granted, but if there’s one bunch that could keep those other Wildcats from Lexington from getting offensive boards, it would figure to be these guys. Now, exactly what is a dauber, and do they really have saddles? It’s only January, but still: Florida’s at risk for missing the tournament entirely, which can’t be terribly surprising when speaking of a team that’s 10-7 overall. Remember the Gators the next time a coach is being criticized for a non-conference schedule so soft it may cost his team a tournament bid. Billy Donovan put together a non-conference schedule so un-soft it may cost his team a tournament bid. Before the start of SEC play the Gators recorded a rather underwhelming 1-6 record against major-conference opponents. True, the fact that the six losses came by an average margin of four points suggests that UF’s likely better than its record indicates. Nevertheless, the full-page ad in the Indy Star headlined “BETTER THAN AN AVERAGE 10-7 TEAM” is not going to sway the committee come March. Short of an auto-bid, the opportunities that Donovan’s men will get against UK on February 7 (in Gainesville) and March 7 (Lexington) could provide UF with the only feasible escape exit ramp off the highway toward NIT oblivion. Connecticut won a national title last season through sequential excellence. The Huskies started their six-game march to confetti by being really good on offense against Saint Joe’s, Villanova, and Iowa State, and then slowly morphed into a more traditional tough-on-D outfit against the likes of Michigan State, Florida, and Kentucky. Kevin Ollie’s guys are still really good at the defense thing, but oh how these post-Bazz characters struggle to score. It’s been painful to watch, as a combination of too many turnovers and a surprising scarcity in offensive boards has starved this offense of shot opportunities. Ryan Boatright wins huge analytic points for somehow being very good on an offense that isn’t coming close to scoring a point per trip, but the prospects for UConn will improve only when Ollie’s senior is no longer having to earn this kind of lone-effective-wolf acclaim. Bob McKillop’s gang continues to be a source of fascination for hoops geeks everywhere due to the extreme performance disparity exhibited by the same five guys depending on which end of the floor they inhabit. The numbers may be correct, and Davidson really might have one of the best offenses in the nation. When you score 36 points in a 30-possession first half against Virginia in Charlottesville, you’re doing something right. And then the Cats turn right around and present a very accommodating “Be our guest” sort of aspect on D: Richmond just rang up 1.42 points per trip against these guys. If you like scoring (keep in mind the Flyers have been kind of accurate in A-10 play so far), I suggest you tune in this evening. I continue to be cautiously optimistic that the Valley has finally produced a team that can make Wichita State at least break a sweat. Northern Iowa may turn out to be the best MVC team from outside of Wichita since the Farokhmanesh-equipped Northern Iowa team from 2010. And the weird thing is UNI is getting it done in surprising fashion. The year-to-year transformation shown on D by (mostly) the same N. Iowa players has been remarkable. Coach Jacobson, I salute you. What is it about funky point distributions and the Mountain West? In most years it seems like New Mexico will either win or lose a string of impossibly close games and thus be egregiously over- or underrated by the good-win/bad-loss crowd. That’s one kind of funky point distribution. Another kind is the FPD where you flail, maim, and destroy helpless opponents. Meet Colorado State, which owes its Tuesday Truths luster to a 98-42 victory over Nevada and to what by comparison was a 70-41 nail-biter over San Jose State. The Rams really were impressive in both those games, and, purely as a point of hoops citizenship, let the record show they properly coasted after halftime in the laugher against the Wolf Pack. I’m not taking anything away from what CSU got done, just flagging the funky point distribution. Hereafter this will be referred to as the CSU FPD. If Saint Mary’s really is worthy of Tuesday Truths’ enormously influential backing, the Gaels have the perfect opportunity to prove it at the Kennel on Thursday evening. In his first two seasons SMC big man Brad Waldow had a good deal of success against the Bulldogs, connecting on 67 percent of his twos. Over the course of three losses to the Zags last year, however, he converted just 39 percent of his tries. Does Mark Few have the big guy’s number? Does he even need to have the big guy’s number when his team’s No. 3 in the nation and playing at home? Tune in Thursday. This entry was posted in counting things, hoops, tuesday truths on January 20, 2015 by johngasaway.